Updated, 7 p.m.: Both DPW and Jason Milligan called police, according to Sgt. Sofia Gulino. NORWALK, Conn. – Angry words followed by conciliatory smoothies marked a confrontation Thursday between Norwalk Department of Public Works employees and real estate broker Jason Milligan. Milligan was “screaming angry,” calling DPW workers “stupid,” and alleging that they were “thieves stealing his property” and “criminals,” Department of Public Works Superintendent of Operations Chris Torre said. The DPW workers called Norwalk Police to assist them in removing an enclosure Milligan erected around a Wall Street signal box, Torre said. The locked structure was a ‘stunt’ that presented a health and public safety risk and prevented access to a “vital piece of equipment,” Norwalk Communications Manager Joshua Morgan said. Norwalk Police did not arrest Milligan or give him a citation, according to Norwalk Police Chief Thomas Kulhawik, who on Friday said Milligan called police, not DPW. Sgt. Sofia Gulino later said DPW also called police. The box controls a nearby traffic signal and pedestrian crossing light, and has been up against the side of 69 Wall St. for years. Milligan acquired the property in December. On Wednesday he had attorney Candace Fay send a letter to the City demanding that the utility box be removed unless suitable terms could be agreed for allowing it to remain. That evening, he enclosed it in a locked structure which he describes as a “fence” and decorated it in Tyvek. The partially constructed Wall Street Place, known to many as “POKO,” is just down the street and wrapped in Tyvek. Milligan is embroiled in a lawsuit filed against him and others by the City and the Norwalk Redevelopment Agency, because he bought nearby properties which were part of the stalled Wall Street Place project without the Redevelopment Agency’s blessing. The utility box letter was phase I of him being on “offense” instead of “defense,” he said Wednesday. City attorneys called Milligan’s play more of a fumble, and Assistant Corporation Counsel Darin Callahan on Wednesday sent Fay a letter stating that a 1956 easement permitted the box, and scolding her for bringing a meritless claim. 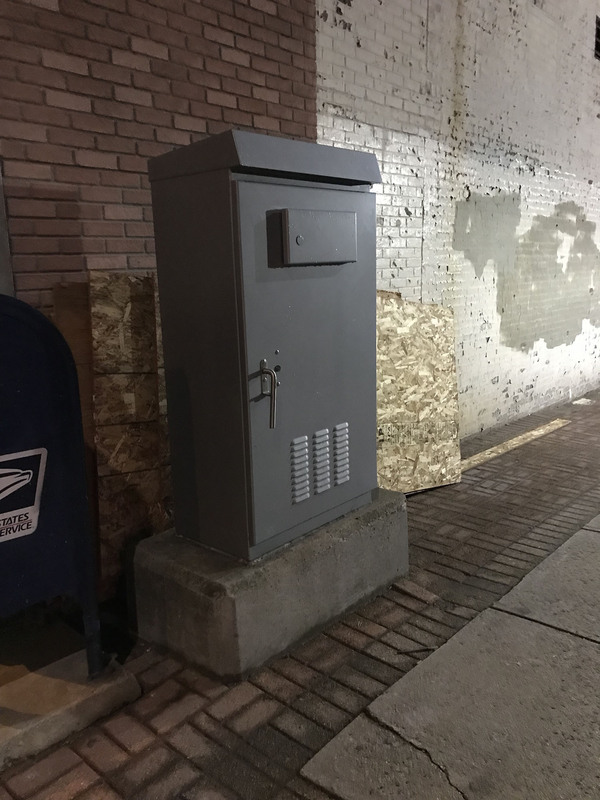 The utility box at 69 Wall St. on Tuesday evening, before Jason Milligan erected a “fence” around it. “Gestapo Police State tactics. Mini Mario ordered it,” Milligan said in a text message, bringing the incident to NancyOnNorwalk’s attention and announcing that four police cruisers and four DPW workers had been on his property. “It is really unbelievable that they expended eight agents of the government at my property for over an hour today,” Milligan wrote later to NancyOnNorwalk. Milligan later said police came because he called them. “With limited information and false assumptions they dispatched a crew to destroy private property on one-hour notice. This is America,” Milligan wrote. “Mr. Milligan has every reasonable ground to believe that he had and has the right to erect the structure in question on the property owned by him,” Fay wrote to Callahan. “DPW almost never requires access to that box. A key would have been readily provided to the police or DPW to open the gate,” Milligan wrote. “It got really testy on the onset. He got very cordial afterwards,” Torre said, adding that Milligan bought everyone smoothies but only one or two people drank them. Milligan said his property had been damaged. “The wooden gate was fastened to my building so that it would not be attached to the traffic box. Some of the facade where it was attached is damaged,” Milligan wrote. “This latest stunt by Mr. Milligan posed a health and public safety risk. It required immediate action by the city to maintain access to its vital piece of equipment. The city gave Mr. Milligan notice to remove the structure he installed, and when he did not, the city did. If Mr. Milligan thinks the traffic box is improperly on his property, he should work through his attorney, and not take it upon himself to render it inaccessible to the city. “Mr. Milligan clearly did this to provoke the city. As much as we’d like to ignore his antics, we cannot when his actions put the public’s safety at risk. “After being harassed, insulted, and repeatedly threatened by Mr. Milligan, DPW staff called the police. When they arrived, Mr. Milligan demanded that DPW staff be arrested. He then bizarrely offered them smoothies. Morgan, in a phone call, made it clear that the statement was from him, not Mayor Harry Rilling. Milligan said several months ago that the Wall Street area has many weird oddities, grandfathered in from another era. The utility box has been on that property for years, and city attorneys say it is permitted by the 1956 easement. “Do you think because I used humor to point out weaknesses in this government that it justifies the police state tactics?” he asked. A radaris.com public records search shows a Candace V. Fay who is also known as Candace V. Milligan, and is similar in age to Milligan. The real estate broker refused to comment on whether his attorney is a familial relation. Just so it is clear with everyone. There is a war going on between Mario and Me. I am using my money and my resources and Mario is using your money and your resources. I am happy to work with almost everyone at City Hall including the mayor. NOT MARIO! I bring up a valid concern about DPW having a box on my property and it is immediately sent to Mario. The guy is supposed to be a part-time employee. EMPLOYEE of the tax payers. Under the reorganization Laoise King is his boss. Why are we letting Mario fight a war? We can avoid Mario or we can fire Mario. I cannot be fired or avoided. Alex Knopp any chance you can step in again and teach this administration some diplomacy? FOUR POLICE CARS REALLY!!! What a waste of resources! Are you kidding! This is a perfect example of the city’s unwillingness to resolve the matter in a proper manner. Instead they use bully tactics. Fish rots from the head! We need new city leadership. Imagine a city led by a mayor that would care about it’s citizens resolve issues without law suits. We have to get rid of Mayor Putin. First using DPW to pick up opponents lawn signs. Then using NPD to promote moveon.org unpermitted events. Now this. Chilling. Naw, man. The “war” is with you and the city. You started it. And the city is using my dollars for your childish antics. Go back to New Canaan and stop using up our city resources. Your sense of entitlement seems to know no bounds. Grow up. Glad to see I am not the only one that thinks taxpayers funding four police cruisers is overkill for a political statement by Milligan. If only City Hall’s responsiveness applied to REAL health and safety issues – like rock crushing near the school and Roodner Court, or notification by Parks and Rec about poor conditions at Vets Park so kids don’t break ankles, or Washington Village residents breathing asbestos dust during demolition or illegal apartments catching fire. City Hall needs to talk with Milligan instead of wasting taxpayer money on lawsuits and city personnel. This is absolutely ridiculous. Happy to discuss your opinion of the origin of this war. There is no way that I started it. Clearly I have done the opposite of back down. Harry Rilling is more used to his use of force having a more effective impact. I am 1 guy. They have a dozen staff lawyers. A full time press release spin doctor. Harry overreacted. Harry is a bully. Most people are scared and cower. Not me! The truth is on my side. Feel free to contact me if your are truly curious. I would be happy to listen to you perspective especially if you are fairly well informed. @Jason I love the fight!!! Please keep it up. These aren’t as some would say Antics! If people have been following you and the Tyvek Tower along with a bunch of other issues they will notice a few things. First you are posting 100% Correct Information!! if anyone has questions they could fact check you. Second as you stated this is your own personal money you are spending NOT, REPEAT NOT Tax Payers!!!! Third, Its amazing the pointed and direct questions you ask of our elected officials that go un-answered: For Example Bob Duff who never stands except for himself..Where is the $5 Million from POKO?!!? Where did that money go?!?! That’s OUR (Tax Payers Money)!! But amazingly the people that want to criticize you seem to be just fine wasting, wasting and wasting more money. Maybe part of the $5 Million went to certain peoples $35K Increase in salary less then 2 years on the job. This is an extremely important election year and we have an AMAZING Independent Candidate running!! Every resident should take a hard look of whom they are casting a ballot for and the answer this election is for Lisa Britton!!! Maybe then the City will stop playing games of Wasting our Tax dollars! I own half of the 15 foot wide alley located between 69 Wall st and the Wall st Theater. There is an easement on the land records to allow pedestrian access and travel across. I do not see an easement for a traffic signal box and I do not believe you have permission or authority to have that box there. I do not wish to have it remain there unless we can come up with fair / appropriate lease terms. Please advise if you are aware of any facts that would differ from my understanding of the situation. Come on Jack, really – Milligan’s comments are accurate and often hysterical. 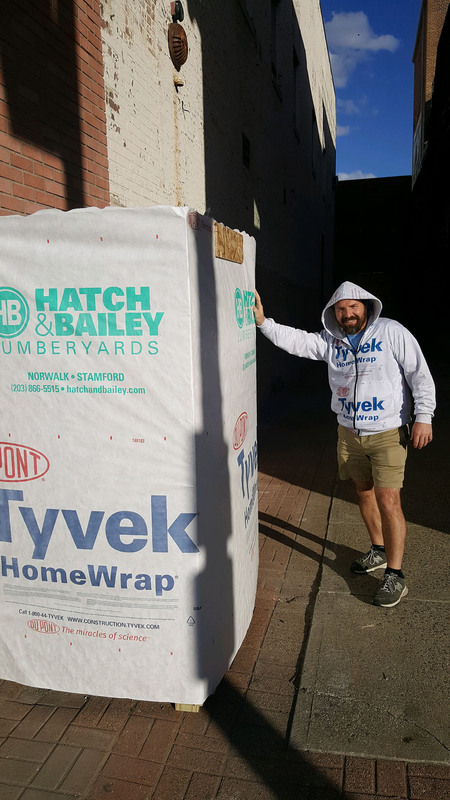 “To blend it into the neighborhood it was appropriate to wrap it in Tyvek” – classic. @Jason “Publicity Hound” Milligan does us all a favor with these acts, as they provide a rare albeit clear window into the petty spirit and bully culture of City Hall. I believe the zeitgeist nomenclature is “punching down”. I agree Mike McGuire, it’s funny – but – it’s also sad, really. The irony for this Greek-rich community are these two faces – the symbols of drama – of the muses Thalia and Melpomene – are Milligan and Mario. Aaaaw! Coochy-coo! Would ya look at that! An adorable baby Tyvek Temple! Couldn’t we keep it, Mayor Rilling? Please? It is so tiny and cute, and so much less obstructive than the gigantic, rotten version up the street. And we don’t even have to feed this one taxpayer dollars! Pleeease, can we keep it? Jason Milligan, you can add political satirist and performance artist to your resume. Love it! rilling refuses to step up to the plate as does marioand duff what a crew and we are being bled as they use taxpayers money. people wake up and vote these people out or stoppaying your taxes,maybe that will mke them responsive. This is a war of ideas. More than happy to debate ideas for how to bring Wall st back with anyone. This mayor does not have the experience or intelligence to have that debate so he resorts to thuggery. Claiming life and safety to destroy a gate around a traffic box that is opened less frequently than the walk bridge is childish and a waste of taxpayer $$$ & resources. Harry can start winning the war by releasing his entire explanatory POKO statement. Although I think we might have a better chance of Trump releasing his tax returns at this point. A robust public debate will produce good ideas that would suddenly get everyone to be on the same side. To quote the Washington Post “Democracy Dies in Darkness”. It is pitch black in all of Norwalk’s secret sessions led by Mario. Just for the record, four police cars, or eight or 10, does not cost the city or taxpayer any more than one. Don’t drag the police into your petty political battles. The officers are working their shift no matter what and doing their jobs to keep everyone safe no matter what their opinion is of city management or the police for that matter. Calls for service or prioritized and if something more pressing or a public safety issue was happening this call would have been put on hold. The Gestapo falsely claimed this was a serious public safety issue. That is how they justified deploying 4 DPW workers. The workers caused damage to my property and removed (stole) my property. No rational minded person would believe that hoax. Access was offered. I resdily admit my gate covered in Tyvek was provocative. The Mayor was embarrassed so he flexed his muscles. I am looming for an intellectual argument and this admin only knows brute force and litigation. The question is whether the taxpayers are okay with the heavy handed bully tactics to silence those that question them? Also what is the recourse when the city & it’s agents destroy or steal private property? Jason, You’re missing my point. No matter who calls the police they will respond and their goal and responsibility is safety and resolving current conflict to prevent harm and/property damage. Your ongoing battles with the city have nothing to do with the officers responding and how many of them respond. How many respond is their call and no one else’s. Many times extra officers will respond to a call without even being dispatched to make sure everyone is safe and things don’t escalate. It’s their job. My point was don’t involve them in your political and civil battles with City Hall. They have nothing to do with that. The comments from several people were criticizing the number of officers. it’s not costing anyone to have an officer drive to a call to make sure everyone stays safe. Nobody’s is being called in from home and paid extra to have an extra police car at an incident. Don’t hurt me and don’t take my stuff. If someone does either or tries to do either I want the government to protect my rights. This government violated my right to liberty and private property. Two things that should be protecting. There is plenty of blame to go around. A better leader coukd very easily escalate or fix this situation. I have not heard anyone defend the heavy handed bully tactics. Mushak please try to spin it.